My first wax melter was just an old cooler that I didn’t like because it couldn’t keep ice for two days. So I unscrewed the top and tossed it. I used a plastic ice cream bucket with screen on top for a while but I couldn’t process much at a time. I bought a small tin cookie pan at a garage sale for .10 cents,(I actually bought 3) and cut open 2 inches in the middle on one end for the wax to flow out. I placed some screen across the top of the pan and crimped it with my fingers. Because the pan had a raised edge, it created a gap under the screen – made it easier for the wax to drop out and run down. I used another garage sale cheapie bread loaf pan and put fine screen across it to catch small debris as it filled up and made a wax brick. Pantyhose works great if it will stretch enough for the bread pan to go inside the foot. I put the bread pan on the bottom towards the end of the cooler, and then a brick on its side at the other end. the brick needs to be slightly taller than the bread pan so you end up with a slope towards the bread pan – thats where you want the wax to run to. Shim as needed. This setup works almost too well. The thermometer shows 159 degrees inside the box and it was low eighties ambient temp outside. 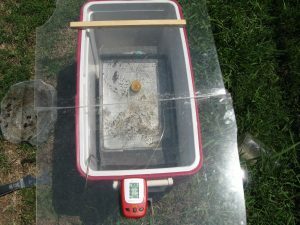 On several occasions it reached 195 degrees and actually warped the plastic on the inside of the cooler. By the end of the summer, the inside of the cooler plastic walls were so bubbled, warped and split open, that I couldn’t use it anymore.